Setting up an indoor automatic watering system for your cannabis grow is not as difficult as you might think. 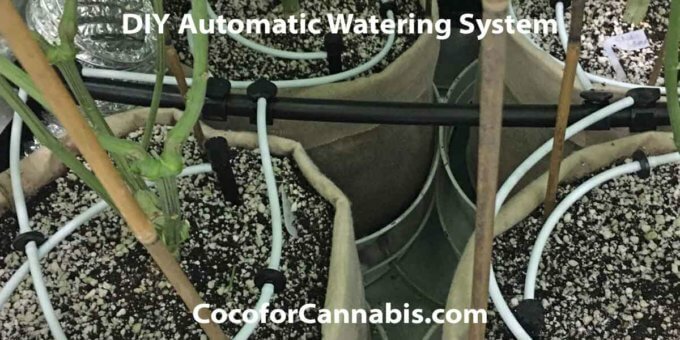 An automatic watering system for your grow tent or grow room makes managing your cannabis grow easier and more efficient. There are relatively expensive kits available, but it is just as easy and far cheaper to purchase the things you need and put it together following the instructions below. The automatic watering system that I describe is designed to allow you to water multiple times per day without supervision. Below you will find complete plans for a DIY Automatic Drip System for your grow tent. We also have plans for Self-Draining Saucers and A Catchment Solution to remove water from the tent. Together these three components create an effective, reliable, reasonably priced and easily set-up automatic watering system for indoor cannabis. Automatic watering systems make indoor cannabis grows much easier to manage. 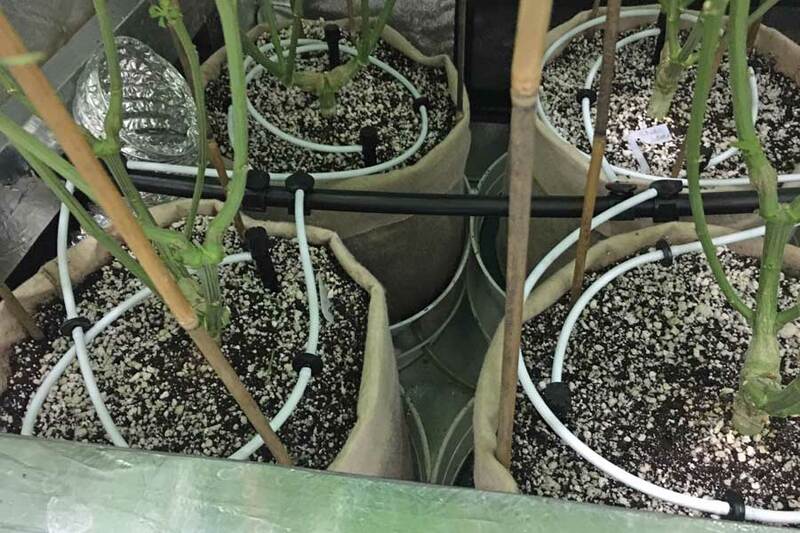 If you are growing in coco/perlite, it is best to practice high frequency fertigation. 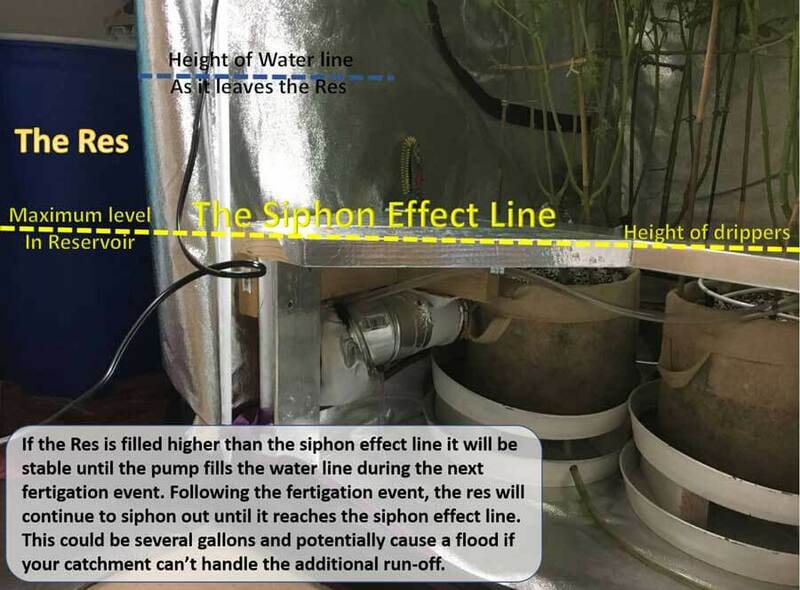 The only way to effectively practice high-frequency fertigation is to set up an automatic watering system. Instead of being tied to the plants at every watering, you can take breaks and let the system run by itself. Just keep water in the tank, the system clean, and the drain bucket from over-flowing! In this guide, I cover setting up your automatic watering system. I include the components that you need and assembly and installation instructions. I also cover the siphon effect problem that will limit the height that the water can be in your reservoir tank. 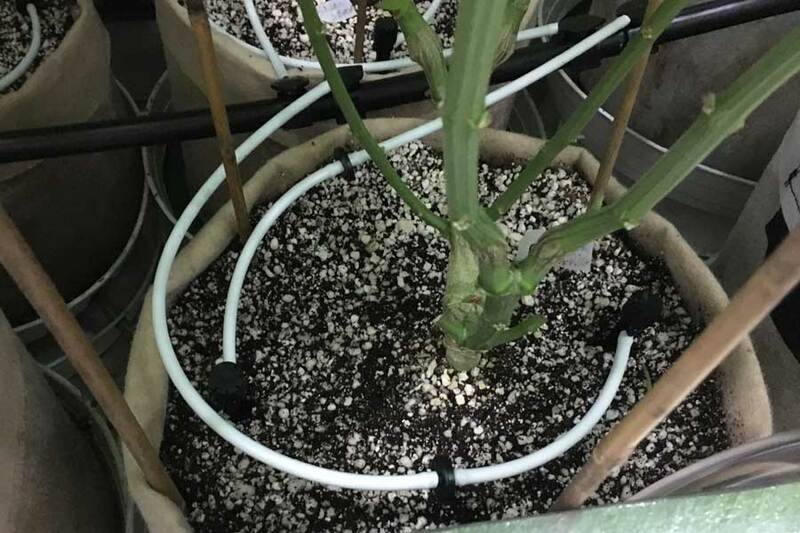 This guide includes all the information you need to set-up your indoor automatic watering system for your grow room or grow tent. Once you get the system in place, there are several keys to managing it properly. Be sure to read our article: “How to Manage Automatic Watering Systems”. We also have several articles and tutorials to help you feed and water your cannabis plants like a pro. 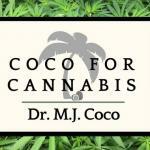 Be sure to read “Principles of Fertigation” and “How to Water Cannabis in Coco” to get started. I have a reservoir that sits outside my tent. The pump sits in the reservoir and runs on a timer. From the reservoir, there is one main waterline that goes into the tent. 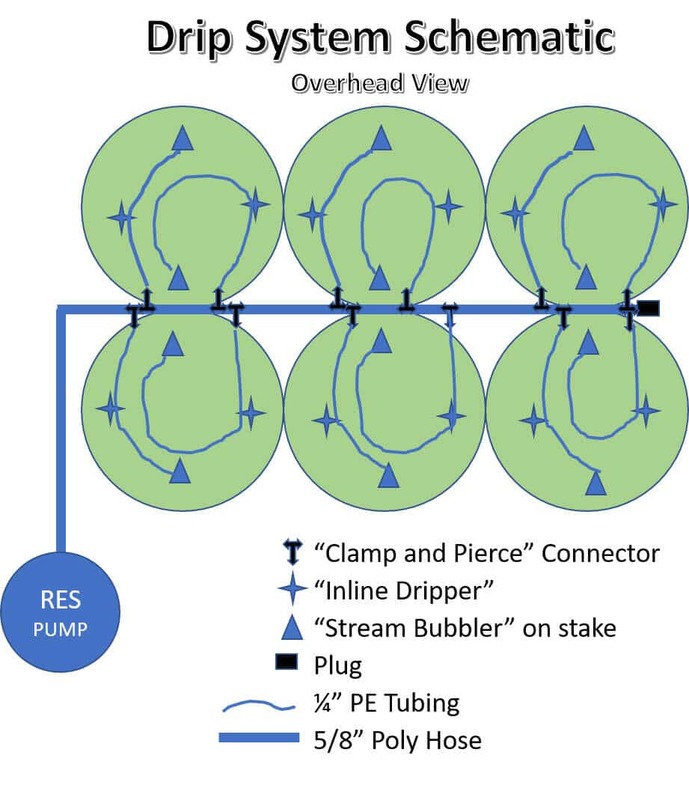 The main line feeds water to several smaller lines which are plugged into it with “clamp and pierce connectors”. Each pot has two of the small lines and a total of at least 4 drippers to distribute water. The pots sit on plant elevators in “Self-Draining Saucers”, which empty to my “Automatic Pumping Drain Bucket”. 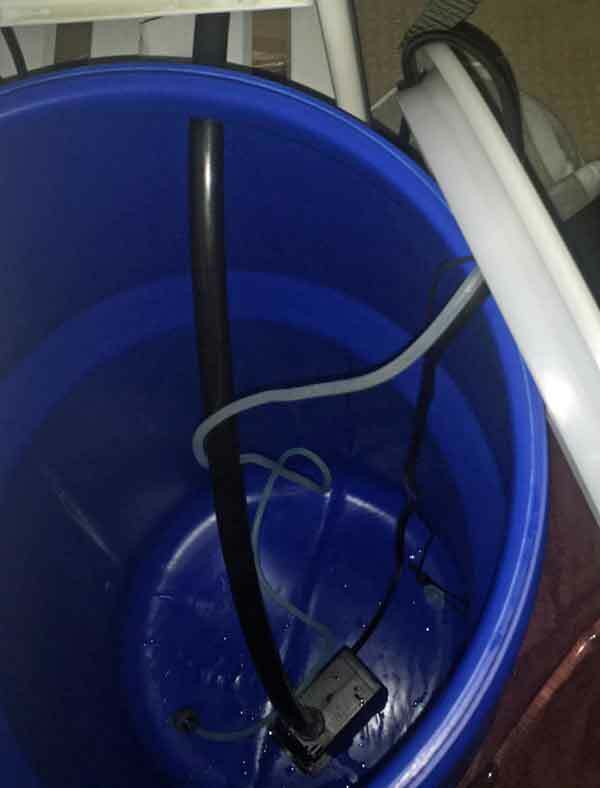 The automatic pumping drain bucket resolves the problem with collecting run-off and prevents you from having to raise your pots within the tent. It automatically moves the run-off water from the tent to a separate bucket which sits outside the tent, next to the reservoir. Anyone can set-up an indoor automatic watering system. It requires no special skills or knowledge. The only tools you will need are scissors or snips to cut the water lines and a drill with a with a 7/8” bit to make the hole in reservoir tank for the water line to pass through. Everything you need to put together the drip system for your indoor automatic watering system is listed below. These are the components that I purchased and use in my own system. I like this reservoir. However, it is tall and therefore incapable of holding more than 8.5 gallons after a fertigation event because of the siphon problem. However, 8.5 gallons is enough for about 9 irrigations in my set-up with 6 plants. That is enough for most situations. Furthermore, the additional height offers the possibility of using a stirring pump and fountain style aeration. This timer has battery back-up, is easy to program, can set many cycles per day, and is programmable in seconds. I found this timer recently and have been using it for the last several weeks. It is the perfect timer for indoor watering systems. You need to oxygenate the water to prevent bacteria. Water with high levels of dissolved oxygen is also great for the plants! The Pawfly Aquarium Pump does a good job oxygenating up to about 8 gallons of nutrient solution. The price is certainly right, and it is all that you need to start. I used the Pawfly set-up for two grows and it worked well. I have since upgraded to the components listed below. The more oxygen the better! 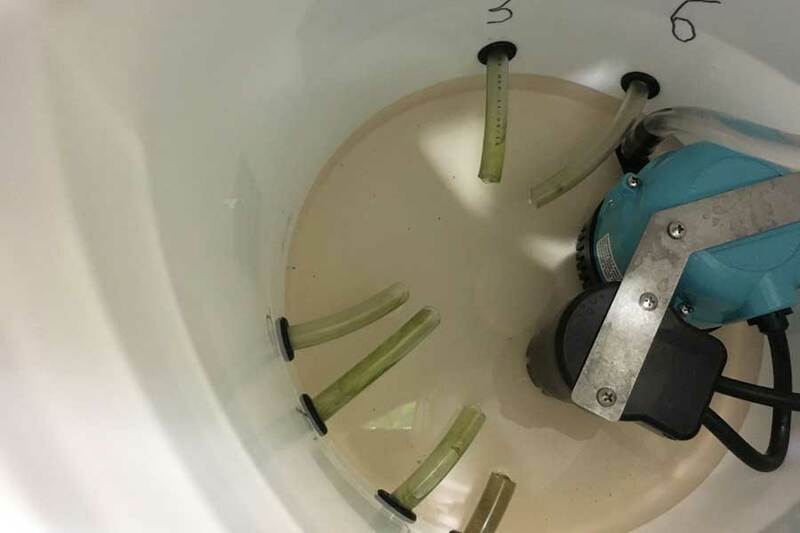 There are several reasons why you would want to upgrade to a more powerful air-pump: If you keep more than 8 gallons in the reservoir, if you have a hard time keeping the tank temperature cool, or if you need flexibility with scheduling your “weekly” tank cleanout. Purchasing your air pump separately allows you to get a much more powerful pump. It is still not very expensive. I use this Hydrofarm air pump and it is perfect for most reservoirs. It is easily adjustable and significantly more powerful than the little pump that comes in the basic option kit above. Pawfly makes a perfect accessory kit for the pump that includes the stones and tubing needed to complete the system. The kit comes with two air-stones and splitters that will allow you to use both stones with one line. This is a simple thermometer to keep track of the temperature in the reservoir. It is best to keep the temperature of the water in the reservoir between 65-68f (18-20c). This temperature range helps to maintain dissolved oxygen and prevent infestation with anaerobic bacteria. Read more in our guide, “How To Manage Automatic Watering Systems”. This is the line that will attach to the pump in the reservoir and run into the tent. 50 feet is much more than you will need, but it is tough to find in shorter lengths. At the end of the main water line you will need a plug. This will force water into the small feed lines that run to each plant. This is the tubing that will attach to the main water line and bring water to the plants. I run two small feed lines to each plant. Each line has one or two in-line drippers and a terminal dripper to distribute the water. You may be wondering how the small feed lines attach to the main water line. There are several solutions, but clamp and pierce connectors are the easiest by far. You simply squeeze them onto the main water line and then slip the small feed lines over the fitting. They come in sets of 5 and you will need two connectors per plant. These in-line drippers help to distribute the water around the pot. You simply cut the small feed lines and then slip each end onto the inline drippers. I use two to four per pot. This set includes 25. Adjustable 180 Stream Bubbler On Stake. At the end of each small feed line you will need a terminal dripper. I use these stream bubblers. The water pressure in created by the pump is not as high as normal water pressure. The bubblers are designed for outdoor use on full water pressure. On their labels, there are pictures where it looks like they spray water around – but in your indoor automatic watering system, they will just leak. Since they are adjustable, you will be able to control how fast they leak, but they will not really distribute the water. You need to distribute the water using at least 2 terminal drippers and 2-4 in-line drippers per plant! There are other options for distributing water in the pots. I am currently experimenting with hydro halos, and will post instructions for setting up and operating them shortly. In the mean time you are welcome to check my grow journal where I am posting about them. Water distribution in an automatic watering system is never perfect. 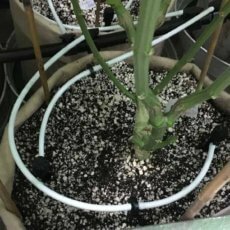 Based on my experience talking to and working with growers with different automatic watering systems, they all have problems distributing the water thoroughly. As a result, I recommend hand-watering at least once per week to prevent dry spots and salt build-up. See our guide, "How to Manage Automatic Watering Systems" for additional tips and recommendations. First, drill a hole near the top of the reservoir tank for the main water line to pass through. A 7/8” drill bit creates the perfect size hole. The pump sits in the bottom of the res with the airstone and thermometer probe. I cut a hole in the lid to run the power cord, air-pump line, and thermometer probe. I covered the small hole in the lid with fabric and held all in place with duct tape. The other end of the water line runs down and into the tent. The main water line should reach its highest point as it exits the reservoir. 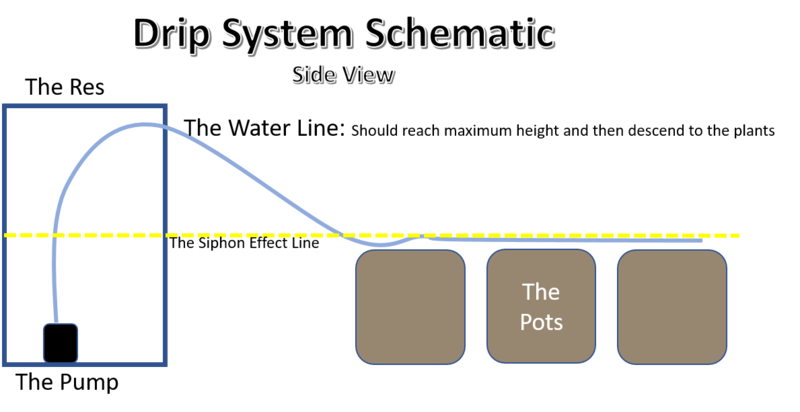 It should then go no lower than the top of the pots (see Side View Schematic). This ensures both that the line drains after each event and that the reservoir does not siphon out and flood your tent. We discuss the "Siphon Effect Problem” further below. I cut a hole in the tent where I needed the water line to enter. Don’t worry, it was easy to seal up around the water line. The water line should enter at about the height of the top of the pots and run across the tent at that height. I support both ends of the main waterline inside the tent to keep it in place. At the far end of the main water line you need to install the end plug. The clamp and pierce connectors do exactly what they say they will do: clamp and pierce. Just position them along the main water line and push them onto the line. The barb should easily pierce the main water line and self-seal. The small feed line can be cut with scissors. You simply attach a section of line, cut it to length, attach an in-line dripper, and then another section of line. The terminal drippers are inserted last. Everything just goes together with a little force. If you are struggling you can dip lines in HOT water and it will be easier. The bubblers should be placed such that the two terminal bubblers are across from each other at (12 and 6 positions of a clock) and the inline drippers are filling in the gaps (3 and 9 positions). See the Overhead View Schematic and the pictures below. The bubblers are adjustable and it is pretty easy to adjust the flow to each plant in place. My fertigation events are 2 minutes and that gets each plant about 1 quart. The water level in the reservoir must be lower than the height of the drippers. Otherwise a siphon will be created, and water will flow out of the reservoir until the water level is at the same level as the drippers. In my set-up, my plants are high enough that I can keep 8.5 gallons in the tank without siphoning. This system must work together with a drainage system. 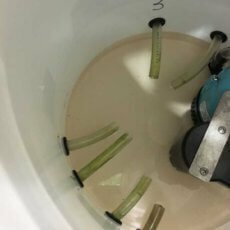 Each fertigation event should produce run-off and you won’t always be there to remove it. 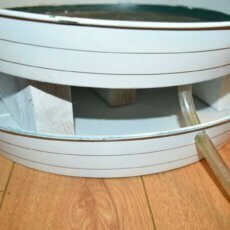 See our instructions for "Self Draining Saucers" and "Catchment Solutions" for an easy drainage solution. Be sure to see our guide, "How to Manage Automatic Watering Systems! I am setting up an auto fertigation system based on your setup. 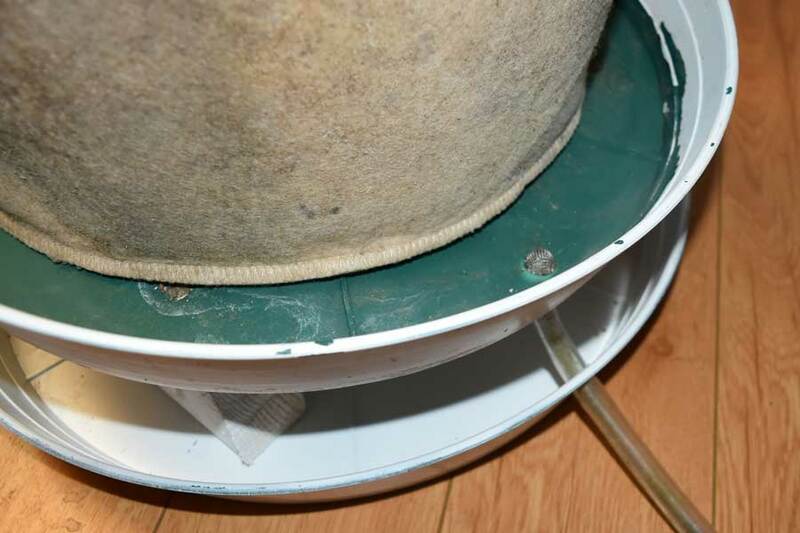 If you cut a tiny hole in the 5/8″ hose inside the reservoir (above the solution level) you will have a siphon break that will allow you to use the full volume of the reservoir. The nutrient solution will piddle out of the hole while the pump is on but it will drain back into the reservoir. First question is, would I be able to avoid the weekly hand watering if I was to put a 6″ halo and a 12″ halo into a 7 gallon growbag, Or would I still get dry spots?? In a 4 plant setup, that would be a total of Four 6″ halos and Four 12″ halos. My other question is, would I be able to run that many halos off the same pump you recommended in this article? I am using the halos now and they have really reduced the need to hand-water. I am testing the limits on my current grow. I think 9″ Halos would be right for a 7 gallon pot and would advise starting there. Also look for tall pots rather than wide pots to help distribution. 7 gallons is bigger than you need and smaller pots also help distribution. I will be updating this article with the halo system soon – I am still making sure that I understand all the issues with it.